Guruka of SikhNet puts Yogi Bhajan's nail clippings in Gutka Sahib for occult powers! "I( Guruka of SikhNet ) kept the nail clippings (of Yogi Bhajan )... & placed them in my Nitnem (Sikh prayer book, Gutka Sahib)."! 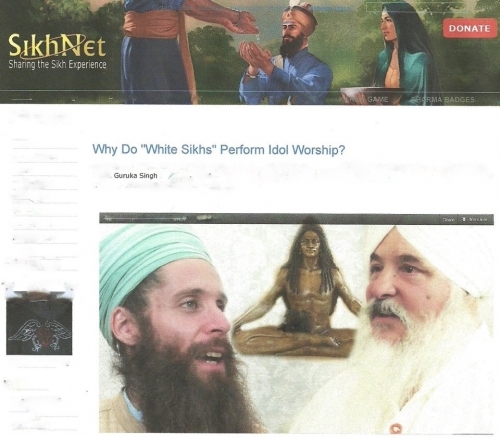 Why has 3HO Foundation deleted Guruka Singh Khalsa's story of how he sacrilegiously uses Yogi Bhajan's nail clippings for occult spiritual & physical power? Guruka Singh goes on to say in his perverted story,"When he (Yogi Bhajan) completed the task he slowly wrapped up all ten nail trimmings in the napkin folding it over and over into eighths. Then he looked at me and extended the wrapped napkin to me saying, "You want these, right?" I replied in the affirmative. He smiled and said, "They will give you a lot of power and protect you."... "Over 20 years later, Guruka Kaur said that she wanted to wear the nail clippings. We bought a lovely antique gold locket with three diamonds on it and Guruka Kaur started wearing it. I had never worn the locket, nor carried the clippings at any time since Yogiji had originally handed them to me."